ABOVE: Karen Parrish says Dr. Andrew Brooks has been a huge supporter throughout her recovery. But the last two of those cruises never saw Karen leave the boat—the pain in her left hip was just too great. Immobilized by the effects of arthritis, she deteriorated to the point of being in a wheelchair. 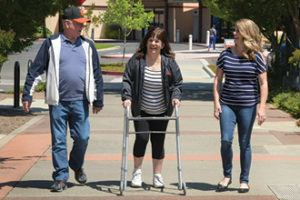 Karen Parrish, center, walks with her husband, Jerry, and daughter, Heather Parrish-Salinas following hip replacement surgery. From that point on, the family agrees, Dr. Brooks and his staff were compassionate, caring, kind and reassuring champions for Karen and, indeed, the whole family. “He takes the time to listen to you and answer all your questions. I think that’s really cool,” said Karen. “Many patients are anxious and nervous prior to undergoing major surgery and it is critical to make sure they understand the process and know that we are there to help and support them every step of the way,” said Dr. Brooks. Karen and the family have nothing but praise for the orthopedics team, the staff at VacaValley Hospital where she had the surgery and recovered, and the physical therapists who continue to help with her rehabilitation. “They had me walking with a walker the day after the surgery and there was Dr. Brooks and Dan Hartley, (nurse practitioner) cheering me on,” said Karen. “It was awesome. They treated her like she was their only patient and you know they have to be busy with lots of patients,” added Jerry. While Karen continues to recover with the use of a walker, she said that will be gone by September when she and Jerry are planning another cruise. “I’m ready to get back out there again,” Karen said.That makes Jerry happy. “It’s like now we are opening up life again,” he said. HealthLoop is a new digital patient engagement software program being used by NorthBay orthopedic doctors to communicate with patients before and after surgery. It uses automated e-mail messages to check in on patients and share information at the right time in their treatment and recovery process. It also allows patients to contact their orthopedist’s office, ask questions and get answers quickly. The NorthBay Center for Orthopedics and Rehabilitation opened in March at 2500 Hilborn Road in Fairfield providing patients with access to their orthopedic specialists, X-ray services and rehabilitation team, all under one roof. It features a team work area, 10 exam rooms, a procedure room, a casting room and a paramedic bay as well as a physical and occupational therapy area that includes six private treatment rooms, several pieces of exercise equipment and five powered treatment tables. For more information, call (707) 646-5599. In addition to the Hilborn location in Fairfield, NorthBay Orthopedics has offices at 1010 Nut Tree Road, Suite 220, in Vacaville. Call (707) 624-7900 for information. Starting Aug. 18, NorthBay Healthcare’s orthopedic experts will offer Saturday sports clinics at NorthBay Urgent Care, 1661 E. Monte Vista Ave., Vacaville, from, from 9 to 11 a.m., through Oct. 27. All athletes are welcome. Just walk in, no appointments will be scheduled. Athletes under 18 must come with a parent or guardian. The initial evaluation is free of charge. Call (707) 646-5599 or visit NorthBay.org/SatClinic.